Dry your vehicle in 1/3 the time! The Original California Jelly Blade has been redesigned with a new shape! Now you can whisk away water faster than ever. Made of medical grade silicone, The Original California Jelly Blade is safe on paint and glass as its new V-blade squeegees away water. A new "Extender" end wipes water out of tight areas, too! 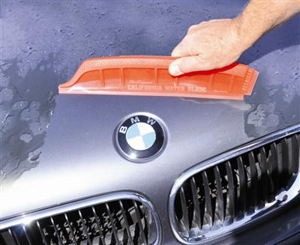 The improved design of The Original California Jelly Blade now removes more water from more areas of your vehicle. The V-blade design hugs the vehicle to wipe away every bit of water. The "Extender" end is a narrow edge that can go into body seams and other hard-to-reach areas. The "Detailer" end is a smaller blade that's perfect for side mirrors. Use The Original California Jelly Blade on paint and on the windows - it can now go anywhere! The Original California Jelly Blade is made out of soft, flexible medical grade silicone. Safer than a rubber squeegee, The Original California Jelly Blade bends effortlessly to conform to the curves of your vehicle. A thicker ergonomic handle makes The Original California Jelly Blade comfortable to use. Dry your entire vehicle in minutes! The Original California Jelly Blade virtually eliminates the need for chamois and towels. Towels require washing and chamois can dry out, but The Original California Jelly Blade stays soft and can simply be wiped off. The Original California Jelly Blade will work best on a waxed or just-washed vehicle. The slickness of wax will help it glide even more easily. You do not need to apply pressure when using the blade; just glide it over the wet surface and watch the water move! It may be necessary to wipe around mirrors and the grill with a microfiber towel to prevent drips. Otherwise, all you need is the Jelly Blade! The Original California Jelly Blade is the fastest way to remove excess water from virtually any surface! The super-flexible handle and V-blade will whisk away water from curves and cavities better than any other drying blade! Dimensions: Total Length 13 1/2". V-Blade Length: 12 1/2". Height: 2 3/4". I have saw these for a while now and decided to try one and I am very pleased ! Cuts way back on towel for drying. This leaves it dry have to maybe use a towel around ornament and where it is hard to get this on but that is very few places. I use it all the time now and don't have to worry about water spots. I use it on glass and flat surfaces and it works very well. I keep my cars waxed, so this blade gives max results. Tip: After washing and spraying off the suds, take the sprayer off the hose. Turn water on and run it over the roof, hood and trunk. On a waxed car, this will cause the water to bead up and leave it almost dry. That actually works! ProsEasy to use, I encountered no damage to painted surfaces, but I use it conservatively on those. Using this significantly cuts down on my drying time. Worth every penny. Works well, except my car has to many curves making it hard to use. My wife will try it our windows at home.